I heard a great story over the weekend from someone who asked why is it that we keep doing the same things over and over again, when we’ve had proof early on that it won’t work? Why do we keep at it, even after it’s clear that it will not work? 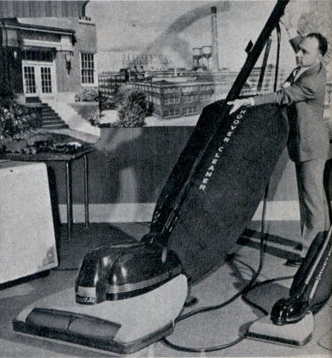 She gave the example of vacuuming her living room. Her living room is 20 feet long, but her Hoover’s electrical cord is 19.5 feet long. It’s almost long enough to vacuum the entire room from the closest outlet. Every time she sets up to vacuum her living room she plugs in the Hoover and gets to work and each time she gets to that part of the room that is a half a foot longer than the chord and goes ahead and pulls out the plug. She pushes the Hoover forward as though, magically, it will finally reach, just this time. But the plug always pops out of the outlet. Surprised? Either she gets an extension cord or she gets a new Hoover. But something is going to have to change. ← Time Out: "Don’t Talk Back to Darth Vader!" You’ve missed looking at it the Anglican Way! What she needs is a smaller room. It would be easy to just sell the house and buy one with a shorter living room, but why do that? To do it the Anglican Way she should hire a very expensive contractor, take out a far-too-big loan from the oldest and most expensive bank in town, finance it over, say fifty years, and demolish the outside of the house to make the desired renovation. Then she have a room which is 19.5 feet long. The only snag is that by the time the job is done either she or the Hoover will be dead and even if the Hoover survives her vaccuums by then will most likely have cords which are 19.0 feet long.